1. What is it? It’s a hit-and-miss collection of re-produced tracks from various horror films and television shows over the years. It provides a great atmosphere of spookiness (and deja vu, if you can’t recognize the music immediately) throughout. 2. 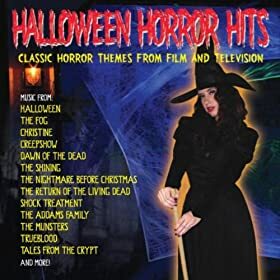 With the exception of a few tracks that include lyrics, this is an excellent set of score music to play at a Halloween party or in front of a house expecting trick-or-treaters. 3. The choice of the “Halloween” theme for the opening track is perfect. And Dominick Hauser’s arrangement is superb. Or maybe John Carpenter’s notes are creepy no matter how they’re played. 4. Dennis McCarthy’s arrangement for “A Nightmare On Elm Street” stumbles a bit with the well-known Freddy poem – though the idea was a good one – but the rest is eerie and worth keeping on repeat during Halloween. 5. Using the word “Classic” in the subtitle is misleading considering that there are a few tracks from “True Blood” thrown in here. 6. Using the word “Themes” in the subtitle is also misleading since some of these tracks are definitely not the theme music from their given movies. 7. The cover art is distracting – and not in a good way (Nothing against self-proclaimed Scream Queen Victoria De Mare – who poses well – but this cover design doesn’t do the album justice). 8. The CD insert features a brief paragraph describing each film included on the album. It’s a bit unnecessary – I’d rather have information about the composer or the track itself. No user commented in " Music Review: Halloween Horror Hits – Classic Horror Themes From Film and Television "